Few home improvement projects are as easy a sell as a deck installation in Phoenix. Though scorching summer temperatures can be a problem, significant chunks of the year yield great outdoor weather. With the right deck installation and planning, you can effectively increase the livable area of your home for a fraction of the cost of a conventional home addition. As much as the hot weather and plentiful sun makes a Phoenix deck installation a great idea, the design of your deck must work with the climate. First, you'll need a decking material that can stand up to the sun. Water is always the principle enemy of wood decking, and even in the dry Phoenix Valley you'll need to seal your wood, but some species of wood and synthetic decking can also lose its luster from the sun's radiation. As with any home improvement project, you'll need to balance a better grade material and a higher initial cost of installation with cheaper materials that won't last as long. Perhaps just as important, quality decks should always be designed to maximize your opportunities to enjoy them. In Phoenix, this usually means installing some type of outdoor misting system to keep the air temperature around your deck at reasonable levels. Better misting systems can lower the air temperature by about twenty degrees, and do it without leaving water droplets on your skin. The conventional wisdom is that you want to get at least three estimates from different contractors for any home improvement project. The same holds true for deck builders in Phoenix. In fact, you might do well to get more than three estimates. You want to look for the best estimate from a contractor who isn't cutting corners on materials or installation, but you'll also need to find a Phoenix deck builder with a construction philosophy to match your decking needs. A high-end deck building company might have an architect on staff, for example, to give you a custom deck that can't be replicated by just anyone. Other companies will offer more pre-manufactured styles of decking that may cut down on cost, but limit your design options. Hopefully, you'll be able to get estimates from multiple contractors all of whom understand what you want from your new deck. 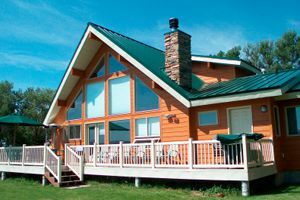 The cost of a deck installation can range all the way down from $5,000 to well more than $20,000. Five grand may give you little more than a patio-sized level deck that does little more than get keep your feet off the ground. Twenty grand will give you a deck with an elaborate raised or tiered deck complete with steps, railings, and possibly enough left over to go ahead and put in an outdoor misting system with the deck. For a middle-of-the-road project, figure somewhere in the neighborhood of $10,000 to $15,000. While your deck installation probably won't return the full cost of the project in additional property value, we typically see returns higher than 80 percent, almost ten percent higher than homes across the rest of the western United States. Assuming you do your homework and find a reliable contractor who shows up when he says, you can expect your deck to be up and running in about one to three weeks, maybe four for larger, complicated projects. You'll probably need to exercise some patience, but at least you won't feel the same type of intrusion associated with interior home projects. Plus, offering a timely glass of lemonade when you get home from work never hurts, either. Comment: I would like to get an estimate for a repair on my porch and porch railing. Please give me a call as soon as possible. Comment: I would like to get an estimate to replace four posts that hold up my porch roof. Phoenix Deck Builders are rated 4.75 out of 5 based on 676 reviews of 18 pros. Not Looking for Decks Contractors in Phoenix, AZ?